Ready to go in the oven with breadcrumbs! Yum! For today's recipe post, I'm pulling again from the Homeroom cookbook. 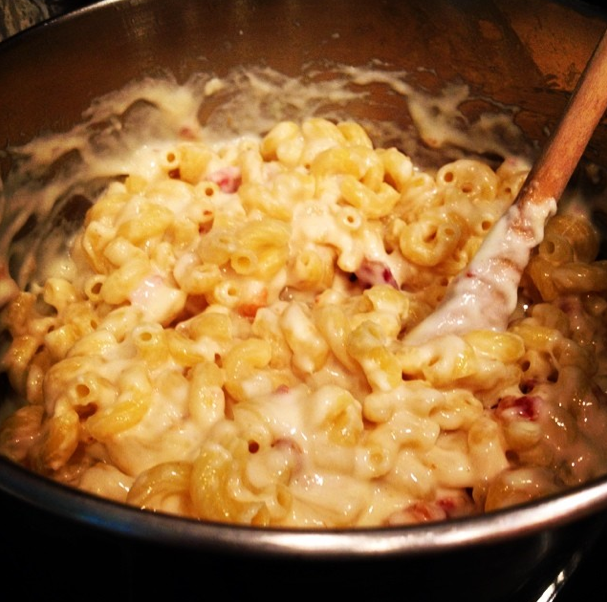 This time, it's the Smoky Bacon Mac. I made this dish for my parents recently and was excited to try something other than the Gilroy Garlic Mac from their cookbook. This recipe calls for (I kid you not) a full pound of bacon. That's a lot of bacon. When you consider that each recipe makes about four servings, that means that each serving should have a quarter pound of bacon. So, of course I was thrilled to make this dish. 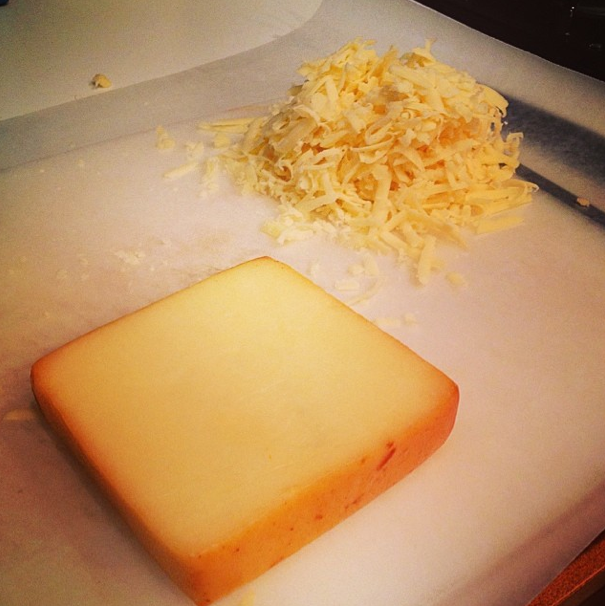 The recipe also called for one cup of grated smoked cheddar and one cup of grated jack cheese. I picked up a locally farmed smoked cheddar and a Clover organic Monterey Jack. I learned a fun tip from the cheese expert at Whole Foods while I was shopping. A quarter pound of chunk cheese will get you approximately one cup of grated cheese. That's some knowledge to keep in your back pocket! There really wasn't much to this particular recipe other than whipping up the béchamel sauce as usual and then melting the cheese and massive amount of bacon in with two cups of the sauce. It was pretty easy to make. No special flavors to add or compound butters to make. The experience of making it was pretty awesome, though. I could really smell the smokiness of the cheddar right away. I had a feeling it would turn out pretty great. Or, at the very least, smell great. Because of my increased interest in preparing homemade mac and cheese lately (hmmm, I wonder why... haha), I decided to try something that the Homeroom chefs explicitly frown upon in their book: I used a reduced fat milk for my béchamel sauce. Cue horrified screams. I thought to myself, "Hey, the cheese is already pretty creamy, maybe the lower fat content in the milk won't matter." I'm not going to say that it drastically changed the texture of the cheese sauce, but I will say that I am now definitely in agreement with the Homeroom chefs that a whole milk béchamel sauce provides a much creamier texture than a reduced fat milk béchamel sauce. I could tell almost instantly when I finished cooking the sauce, even before I added the cheese, that it wouldn't be as rich as some of my previous attempts with whole milk. So, how did the overall mac turn out? Not bad. Definitely not as good as the restaurant quality, but not bad. I would be really interested in finding out what smoked cheddar Homeroom uses at their restaurant. There were actually a few choices for me, but I went with a local California cheese because I thought the softer texture would melt easier than the two salty English style choices I had. And, for the record, we ate ALL the bacon.